Clinicians chose healthcare as their profession to help patients, not to become technology experts. 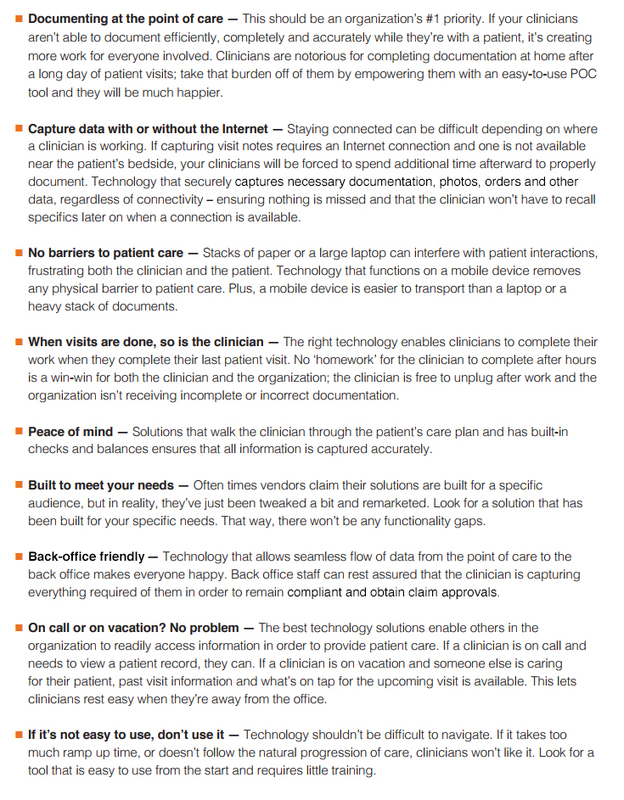 Clunky, rigid documentation systems become a burden and create an unfriendly wall between clinicians and their patients. The ability to document at or near the point-of-care not only eliminates “homework” for the clinicians and allows them to complete their documentation faster, but it also improves accuracy since they do not have to rely on their memories hours later. No ‘homework’ for the clinician to complete after hours is a win-win for both the clinician and the organization; the clinician is free to unplug after work and the organization isn’t receiving incomplete or incorrect documentation. This holiday season, give your clinicians a point-of-care tool that was designed FOR them by other clinicians. Our iPad app is easy to use, intuitive and extremely efficient AND it allows your clinicians to access their patient records and document with or without Internet access.